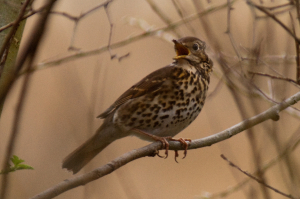 Observation - Song Thrush in song - UK and Ireland. Description: Watched and enjoyed this bird singing for ages today - one of many Song Thrushes seen and heard today. Watched and enjoyed this bird singing for ages today - one of many Song Thrushes seen and heard today.